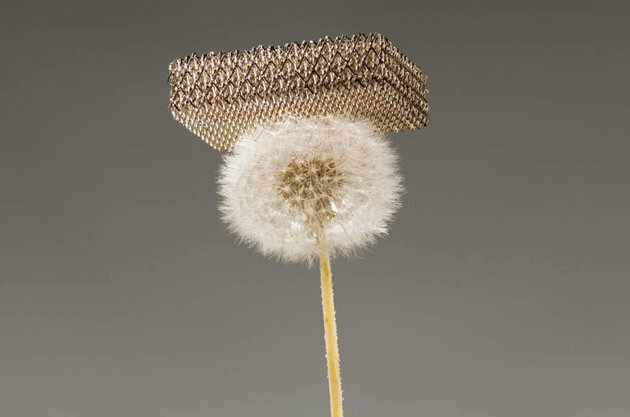 A team of researchers from the University of California at Irvine, HRL Laboratories and the California Institute of Technology have come up with a metal lattice material that is the lightest solid yet discovered. As you can see in the photo above, a sample of it can be perched atop a dandelion without damaging it at all. This stuff has less density than the air surrounding it! It's also much stronger than aerogel: the previous "lightest solid" title holder. It's stories like this, friends and neighbors, that still give me a reliable sense of optimism about the future. Who knows what the uses and demand for this stuff will end up being.